AP Economics Teacher, dedicated staff member and the 2007 Texas State Karate Champion are just a few descriptions of our amazing JKL instructor, Mark Finlay! Mark is in his 4th year as a JKL instructor for the Eastern Hills H.S. program and has been teaching at this school for 11 years. Mr. Finlay openly admits that since the inception of the JKL program, it has brought such a positive environment; a change that he had not seen before on the campus. Many of his JKL alums come back week after week to check in and also help lead workouts for the program. The JKL community service events are the most important aspect of the program to Mr. Finlay. He was quoted saying, “Seeing kids working together outside of the school and giving back in the community is a great thing.” Mr. Finlay has displayed what it means to be a passionate instructor who goes beyond his JKL duties to ensure a quality program. We’re thrilled to announce that we have confirmed a couple of exciting names for our big annual fundraising event “Mack, Jack & McConaughey” (MJ&M) in Austin, TX this April. Grammy Award-winning band Dixie Chicks will headline the 2018 MJ&M Gala on Thursday, April 12, at Austin City Limits (ACL) Live at The Moody Theater. Tickets are on sale TOMORROW – Friday, March 2, at 10:00 am CST and available to the public at https://www.ticketfly.com/purchase/event/1652770?utm_source=artist. Additionally, Grammy-Award winning artist Patty Griffin, along with Butch Walker, John Fullbright and more are set to perform at the Jack Ingram & Friends concert on Friday, April 13, 2018 at Austin City Limits (ACL) Live at The Moody Theater. Tickets are on sale now HERE! We can also share the great news that renowned fashion designer, Stacey Bendet of Alice + Olivia, will showcase her latest collection at the exclusive MJ&M Fashion Show and luncheon at JW Marriott in Austin, Texas on Friday, April 13. The show is hosted by Sally Brown, Amy Ingram and Camila Alves McConaughey with presenting partner, Neiman Marcus. Please visit www.mackjackmcconaughey.org for more information on these great events and more! 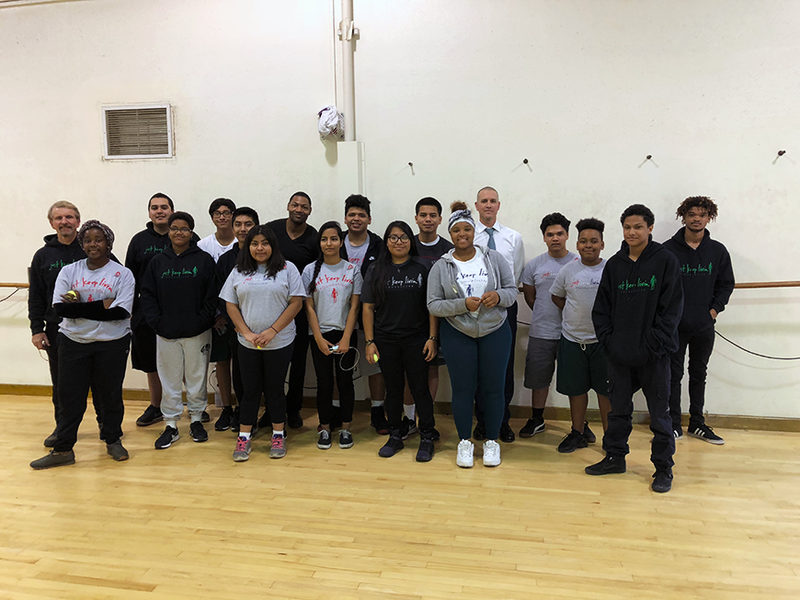 On Monday, January 29th, just keep livin Foundation Board Member Jim Toth spoke to the JKL students at Hamilton High School in Los Angeles. Part of the JKL curriculum is to discuss the quotes of the month that Matthew has provided for our programs. Jim did a wonderful job tying in January’s quote of the month about “curiosity” and encouraging students to stay curious in life! Jim’s message about the importance of becoming comfortable in situations when students are uncomfortable really resonated with them. Jim emphasized to the students that even though they may feel uncomfortable in certain situations, it is through those very experiences that they will be able to grow. Thank you Jim for taking the time to connect with our students and encourage them to embrace life! On Sunday, February 11th, our Los Angeles JKL programs came together for the 6th Annual Upward Bound House Home Run for Kids. Our students continue to show resilience year after year for this great event as they run to help end family homelessness! All of the JKL training sessions paid off for our students when they embraced each other on race day! We had over 30 JKL student runners participate and one of our students from Manual Arts, came in 3rd place! We are so proud of our students for showing up and doing their best! We look forward to bringing our JKL students back once again to encourage one another, have fun and challenge themselves with a smile. We really enjoyed getting together with our just keep livin Foundation Board of Directors and Advisory Board recently to recap 2017 and brainstorm for how to make 2018 even better! We hold these meetings once a year and it is always so revitalizing for us and for our programs to be able to come together and share successes, challenges and new ideas! This past year was our biggest fundraising year yet and that kind of growth would not be possible without the support of our Board. It takes a village to have the kind of impact our programs are having and we are so grateful for the support of Matthew and Camila and all of these generous and passionate individuals who have the biggest hearts and love to give back. Cheers to a great rest of 2018! Spiced Edamame – I bet you heard the word ‘edamame’ a few times before but are still not sure what that is. Well, ‘edamame’ is just a fancy word for green immature soybeans. Don’t be fooled by this funny-sounding name, edamame tastes much yummier than it might sound and they are so good for you! Just half a cup of edamame really punches up the fiber, protein, vitamin and mineral content of your diet. They are one of the best ways to avoid a complete snacktastrophy. Just take them on-the-go in ziplock baggies or top your salad with 1 cup. You’ll love it! Thaw the edamame and pat dry with a paper towel to catch excess water. Toss edamame, olive oil, and seasoning in a bowl. Spread the edamame out on a baking sheet lined with parchment paper. Roast 30-40 minutes. Stir every 10 minutes. Watch for the edamame to puff and turn golden brown. Remove the baking sheet from the oven. Let the edamame cool before eating. You asked for it, and… alright alright alright ~ here it is! Like our other shirts, it is made of super soft 100% cotton. Charcoal grey with red, white and blue screen print on front and blue screen print on back yoke. Shop Now! Whether you’re an athlete, weekend warrior, or a sedentary individual, your muscles accrue very uncomfortable adhesions which might be causing lower back pain and other joint pains.